At an open house at its research facility in Nara, central Japan, the company said it will look to leverage its LCD and home appliance technologies in new, totally unrelated fields. For instance, Sharp said its powerful lighting , developed mainly for backlights in TVs, can also be used to raise crops out of season, such as strawberries. 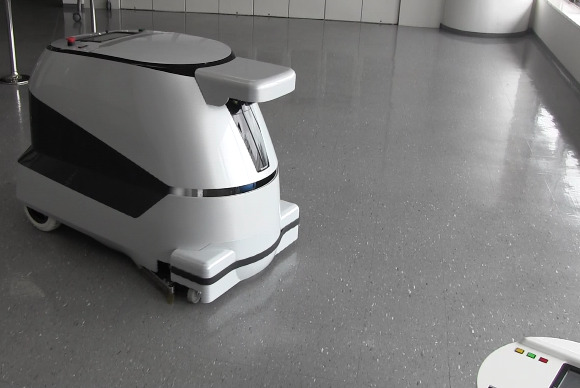 And based on the success of its “Cocorobo” home robotic vacuum cleaners, the firm says it will look to expand into manufacturing industrial cleaning robots for public spaces such as train stations and office buildings. “Rather than follow a strategy for a low market share in a large market, we are looking to pursue higher market shares in smaller markets,” said Shigeaki Mizushima, a Sharp executive in charge of new business development. 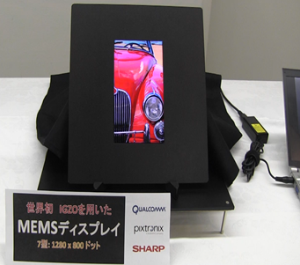 A Sharp prototype to create displays based on MEMS technology. Mizushima said Sharp must maintain its competitiveness in large markets like the LCD panel business, but will attempt to build new businesses in area such as robotics, health care, and education. Initial products will be launched later this year. Sharp aims to generate $842 million in new business in those areas within three years, he said, with half of that coming from outside of Japan. 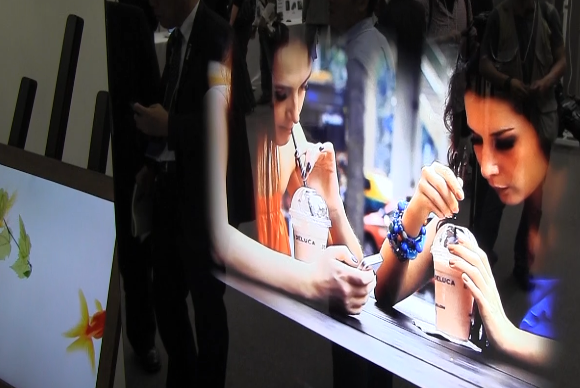 A prototype display that can show high-resolution images on a mirror, for use in public spaces as well as home TVs. Sharp recently teetered on the edge of insolvency and had to take steps such as cutting workers and closing factories, putting up its headquarters as collateral, and pursuing partnerships with rivals to stay afloat. The company last month posted a massive $5.6 billion loss for the latest fiscal year, but said its restructuring and partnerships are easing its cash crunch. Sharp aims for a small $51.6 million profit during the current period. Mizushima said the company’s earlier success, when it timed the explosion in LCD TVs perfectly and dominated the Japanese mobile market before the current smartphone boom, led to its recent failures.